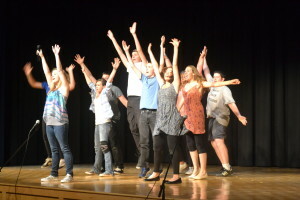 The Schoharie Creek Players and WAJ Drama Club teamed up to present scenes from Michael Gore’s “Fame” on Friday July 17th. Jim Starr directed the show along with choreographer Ashley Becker. They enjoyed working with the students and pushed them to do their best. Eleven local students from WAJ’s drama department took part in the summer workshop. These young actors worked hard for two weeks from 9am-12pm everyday in WAJ’s auditorium. It certainly paid off as they put on an amazing musical for the community. They learned a lot about the theater including different vocal exercises to get warmed up. Jenna Lashua, a tenth grader and budding actress, played the role of Mrs. Sherwood. She said that it was a fun experience and she enjoyed working with her peers. Every spring the WAJ Drama Club puts on a performance, however this workshop gave the students an opportunity to showcase their passion in the summer as well. The students combined acting, dancing, and singing into one great show! It received many laughs and applauds from the audience. This production was made possible by funds from the Windham Foundation, who continues to be a major supporter of the arts. This is our third year funding a summer drama program for local teens, said board member Phyllis Parrish. Jim Star brings out the best in each student. They grow a lot in two weeks. The Windham Foundation is a 501c3 non-profit organization, www.windhamfoundation.com.